*Folds flat in seconds without tools. 48" long hangrail with two 12" pullouts. 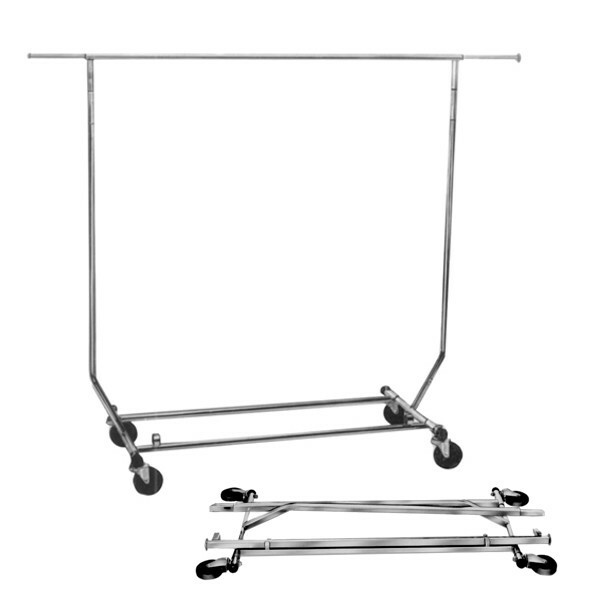 Adjusts in height up to 65". Heavy duty 4" casters. Round Tubing Collapsible Garment Rolling Rack -Single bar rack is the perfect place to hang your apparel to be noticed by your customers -One rail at 48" perfect for maximizing your display space -Collapsible for easy storage or transport -Rolling 4" wheels attached to the bottom allowing the rack for smooth rolling Dimensions: *Folds flat in seconds without tools. 48" long hangrail with two 12" pullouts. Adjusts in height up to 65". Heavy duty 4" casters.